Make your room a dragon sensation! Huge wall mural measures 10-feet wide x 6-feet tall! Hiccup and Toothless, Astrid and Stormfly, and more. Inspired by Dreamworks' How to Train Your Dragon. Your favorite characters from Dreamworks' How to Train Your Dragon are here in this How to Train Your Dragon Character XL Chair Rail Prepasted Mural. 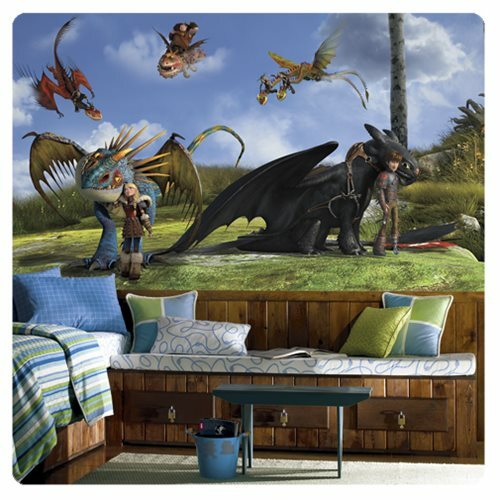 It will transform your room into the island of Berk, with dragons flying all about and Hiccup and Toothless plus Astrid and Stormfly hanging out on the ground. The huge mural measures 10-feet wide x 6-feet tall!